If you want to buy a Tesla that doesn’t have airbags filled with moist, succulent ground beef or a dash covered in the finest Nova Scotia salmon, you’re in luck, because the Tesla Model X will be available in vegan-friendly trim. PETA is claiming this is in response to them, but Tesla disagrees. The non-vegan parts of the car are, in case you were wondering, the leather used for the seating and interior. As far as I know, Tesla has never used whalebone for its A-pillars or anything like that. 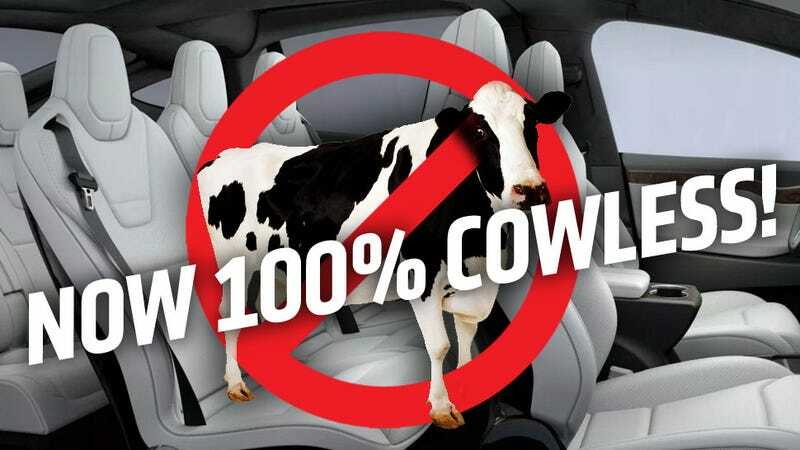 Tesla claims they’ve always had non-leather options for their interiors, in the form of cloth seats, but if you’re vegan and want things to feel like they’re covered in the skin of a dead animal, but really aren’t then you’ve been out of luck. Well, until now. For the Model X, Tesla is now offering synthetic leather, so vegans won’t really have to give up anything when they buy a Tesla. I’m also told that the synthetic cows the synthetic leather comes from are kept on an free-range synthetic ranch, and are treated with dignity by synthetic ranchers until they’re slaughtered, virtually, in a painless manner that’s also accepted as synthetic Kosher, as certified by the Chief Synthetic Rabbi of Synthetic (and Ashkenazi) Judaism. When PETA, a Tesla Motors shareholder, spoke at Tesla’s 2015 annual meeting to urge the company to offer only vegan leather for its car interiors, CEO Elon Musk said he would “absolutely” consider it. Since then, PETA has been working with Tesla, and this month, the electric-car leader launched Model X—its highly anticipated SUV—which is available with a fully vegan interior, including seats, steering wheel, and gear shift. While PETA may have had some influence, it’s not like this hasn’t been discussed before; entries on Tesla boards about this very issue go back to 2012. Besides, the market demographics of Tesla buyers likely include a somewhat higher-than-normal percentage of wealthy, showy vegans, so it’s hardly a surprising option for them to offer. It’s an electric car. Sustainability is a big reason why many people buy these, and veganism is often part of that mindset. So, there you go! If you’re a vegan who’s too good for cloth, get in line for your Model X. But I don’t think we need to give PETA all the credit for this one.